A new chief executive has been appointed to manage the thousands of acres of land that make up Peterborough Nene Park Trust. Matthew Bradbury (50) has taken over as boss of the trust, which is responsible for 1,725 acres of parkland and which includes the popular Ferry Meadows Country Park. It’s a great opportunity to take on a very well run and competent organisation. Mr Bradbury said he was delighted to have joined the trust. He said: “I am delighted to be here. I’ve had a fantastic welcome. Mr Bradbury takes over from former chief executive James McCulloch, who left last December after seven years. Mr Bradbury joins from the Land Trust where he spent four years as director of operations. He was responsible for the management and development of more than 2,000 hectares of land made up of country parks, nature reserves, Scheduled Ancient Monuments and public realm. He was also responsible for fund-raising, income generation and voluntary support to enable the land to be managed sustainably. Mr Bradbury said he did not see any need for immediate changes but there would be a greater emphasis on fund raising and marketing. He said: “My key aims will be to broaden our fund raising by looking at grant-making trusts, such as the Heritage Lottery Fund, commercial fund raising, corporate sponsorship and legacies. “The trust’s had a tough couple of years and has operated with a deficit of about £250,000 for the last couple of years. However, this is mostly due to the large investment the trust has made in the Lakeside Centre and the golf centre. Would you believe it? 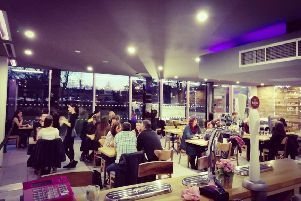 Peterborough’s number one restaurant is vegan! Mr Bradbury added: “Over the next six months we will be reviewing the trust’s 10 year strategy and will be continuing the current themes but maybe with a few tweaks. Anything we do will be measured and done with consultation.